As Liz and I talked about this movie, she pointed out that she liked it partly because she did not live through the Watergate scandal, so everything she knew about it was the glossing over it gets in the media these days. FROST/NIXON worked for her because it put a human face to the caracature that is Richard Nixon. And while he wasn’t sympathetic, per se, it was at least easier to understand his motivation. I couldn’t have expressed it better myself. And, as I think about it now, I feel like that will be this movie’s endearing legacy. 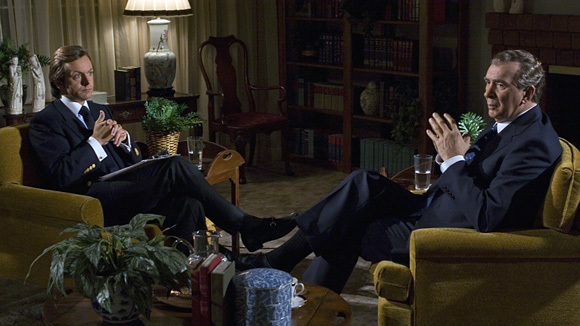 It is the true story of talk-show host David Frost garnering an exclusive interview with Nixon post-Watergate. I watched FROST/NIXON (2008) in theaters on 2.19.09. It was my first viewing of the film. ~ by johnlink00 on February 20, 2009.